August was a nice opportunity for L'Expédition Scyllias to go and have its fins ducked in Crimea when our Ukrainian friends organized a meeting in order to reinforce the good relationships which we have been keeping alive since 2003. At that time, a first Ukrainian-French expedition had been led to dive and visit a few WWII shipwrecks laying off Balaklava and Sevastopol. Now the program was a bit different and we particularly wanted to establish new connections in order to organize common expeditions in Crimea and Brittany. The operation was proposed by Jean de Reydet, honorary member of our association, who was also present. 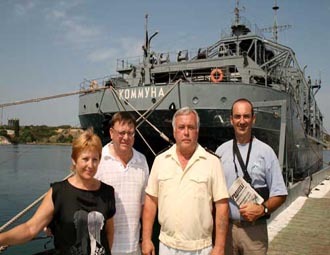 In Sevastopol, L’Expédition Scyllias met Serguei Voronov, the head of the underwater archaeology department of the Ukrainian Sciences Academy in Kiev. We then took advantage of the opportunity to visit the famous Russian Navy ship Kommuna, a real ancient monument who was laid down in the beginning of the twentieth century and is still, nowadays, in a pretty good state ! This 96 metre-long ship for a beam of 19,32 metres was, when she was launched in 1913, the fruit of a revolutionary concept with her catamaran design. Since her commissioning she succeeded in refloating about one hundred submarines, down to 80 metres depth, and numerous diverse shipwrecks, even many tanks during the Leningrad Blockade. To have evidence of her efficiency, her solidly built with her riveted hulls and the serious maintenance of the Russian Navy, the Kommuna is still in activity today as a rescue submarine support in Baltic Sea and Black Sea ! Indeed she is not a museum-ship but an operational vessel who is probably the oldest one of the world in a Navy. Among us was Andrei Loubianov, a former officer and ship designer for the Voenno Morskoï Flot (Russian Navy), also expert in deep sea rescue submarines, writer, renown historian and correspondent for the VMF. We then participated, for several days, to the famous underwater excavations in Novyi Svet, Northern of Soudak bay. 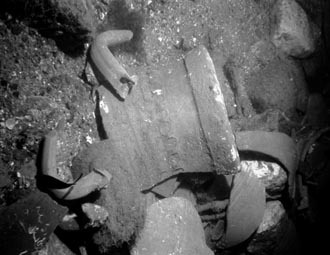 The purpose of this operation was to study a XIVth century Pisani shipwreck who used to bring victuals and animals. 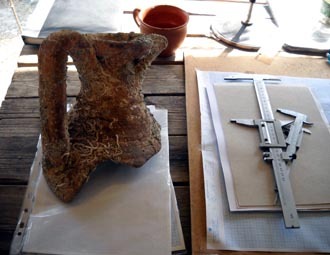 This entreprise was led by Sergueï Zelenko, the manager of the Archaeology and Studies Department at the Faculty of History of Taras Shevchenko National University in Kiev, and his team. 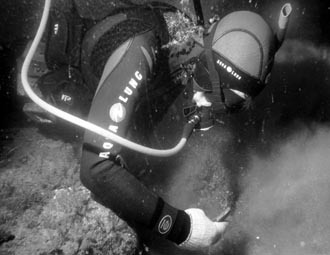 It allowed us to become acquainted with excavation techniques and to make, with the underwater video maker and journalist Sergueï Denisov (honorary member of L’Expédition Scyllias), exciting photographs of the site. On the left : diver at work on the pottery field. Au centre : a part of the Ukrainian- French team after a dive, with a piece of pottery. On the right : another piece of pottery is analysed at the camp. 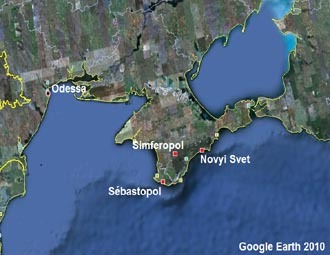 In Simferopol, the capital city of the Autonomous Republic of Crimea, L’Expédition Scyllias participated to the shooting of a television program broadcasted on the national channel, an opportunity for the viewers to discover underwater pictures of the shipwreck in Novyi Svet which is a part of their submerged patrimony. Jean-Louis spoke about Brittany, its abundance of underwater richness, and evokated future French-Ukrainian operations. 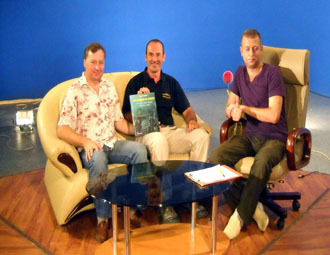 On the left : Sergueï Denisov and Jean-Louis on the set of the national television of Crimea presents les Gardiens du Silence (Silence Guards) during a TV broadcast consecrated to this Ukrainian-French meeting. Au centre : piece of pottery in Novyi Svet excavation. To finish this trip, L’Expédition Scyllias was invited to the private viewing at Simferopol art gallery of the new show of Sergueï Busnenko, world-famous make Ukrainian underwater photographer and corresponding member of the F.I.A.P. (International Federation of Photographic Art). This trip was extremly enriching on the human plane as it allowed us to establish many new connections with well-known people in the Ukrainian and Russian world of diving and to reinforce the dynamic founded a few years ago. This should help us to finalize middle-term projects in common. 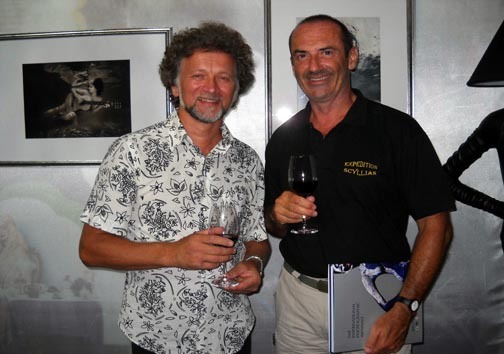 On the left : Jean-Louis and Sergueï Buslenko the private viewing of his underwater photographs show in Simferopol, the capital city of the Autonomous Republic of Crimea. 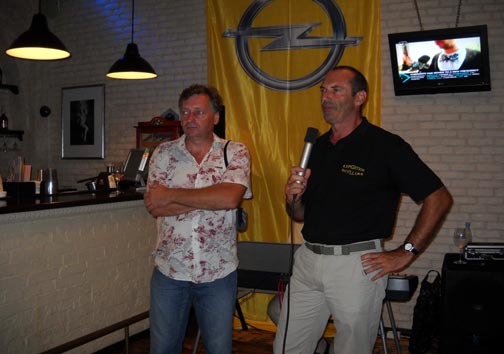 On the right : Sergueï Denisov and Jean-Louis who was presenting L’Expédition Scyllias during the same private viewing, in Simferopol.